Toronto Botanical Gardens – 11:00 am. – 3:00 pm. You’re invited! 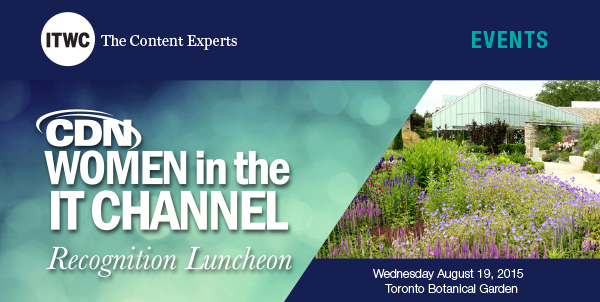 CDN and founding sponsor Ingram Micro Canada are pleased to welcome you and a guest as we celebrate exceptional women in the information technology channel as demonstrated by their contribution to the growth of their organizations and the channel overall. We are also pleased to host Ayelet Baron as our keynote. Previously the chief strategy officer for a leading major technology firm, she now focuses on pioneering more people-centered ways to work that leverage new tools to connect, collaborate and innovate. Ayelet Baron will be speaking on How to Shift from the 20th Century Myth of Work-Life Balance to 21st Century Lifeworking. This is the first time in the history of work where five generations are working side-by-side. And, while differences among them are widely recognized, a new commonality is emerging in shared perspectives and attitudes. Delving into this is, Ayelet will disband the myths of work-life balance and provide evidence that we are moving to a culture of ‘lifeworking’ that resonates with all generations.